Facts and information about the History of Clothing and regalia of Native American Indians and the Native American Headdress. There were many different types and styles of Native American Headdress. The types of headdresses not only varied from one tribe to another but the types of headdresses also varied within a tribe. Native Indians are most closely associated with the magnificent feathered war bonnets worn by the buffalo hunting tribes of the Great Plains. However, this is only a small part of the the story. Ceremonial headdresses were worn by practically every tribe across the North American continent from Florida all the way up to Alaska. This article contains interesting facts about the Native American Headdress. Native American Headdress Fact 1: The Native Indian Tribes wore many different styles of head gear which varied according to their location, the materials available, the beliefs of the tribe and the symbolism attached to them. 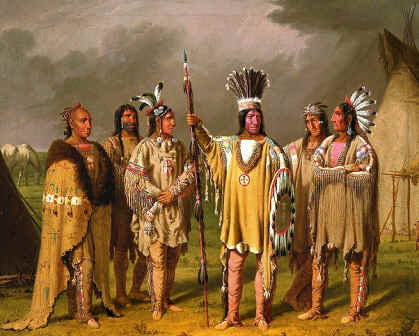 Native American Headdress Fact 2: They were highly intricate items of clothing and only worn by the men of the tribes. Native American Headdress Fact 5: The tribes of the Great Plains including the Sioux, Cheyenne and the Chippewa wore the long, trailing feather headdresses referred to as war bonnets. Indian Headdress Fact 13: The turban style headdress that was worn by many of the southeastern tribes including the Seminole, the Yuchi and the Pima. The turban was made with strips of cloth, such as calico or wool and wrapped around their head like a turban. The turban style headdress was often decorated with a feather plume which was considered to be of spiritual significance holding great power. For additional facts about headwear refer to the articles on Roach Headdresses, Feather Headdresses, War Bonnets and Native American Turbans.